Band Bio: Ray LaMontagne was born in New Hampshire ("But we were just passing through," he points out), one of six kids from various fathers?all raised by their resourceful mom. His mother and father, a musician who now works in Nashville, split up soon after his birth ("I've talked to him for a total of about a minute and a half in 20 years," Ray says ruefully), and Mom went wherever she could put a roof over her children's heads?from Utah to Maine and points between, where they resided in an assortment of unusual domiciles: the backyards of his mother's friends, in cars and tents, a cinderblock shell on a Tennessee horse ranch, a New Hampshire chicken coop. Ray was always the new kid in school? "and I had this nose when I was like 10," he says, laughing softly, "so you can imagine. It was tough. "I was horrible in school," LaMontagne remembers. "They didn't know what to do with me. I'd just draw or write stories. I had a really tough time, but I squeaked by. By the time I was a freshman in high school, I just stopped going all together; I'd just go into the woods. That was really hard on my mother. I got in fights all the time; Trouble found me. I was just a misfit, an oddball. Those years were tough. By the time I reached my senior year, I knew I wanted to graduate. So I went to school during the day and at night for a year and barely got through high school." He left his family right after graduation, with no idea what he wanted to do. Four years later, while working long hours in a Lewiston, Maine, shoe factory, he experienced an epiphany?one that shook him out of his deep ennui. "This was a particularly dark and weird time for me," he recounts. "I never saw the light of day for months. One morning, after I'd worked there for about a year, I had my clock set for 4 a.m., like always, and I woke up to this amazing sound coming from the clock radio. It was Stephen Stills, doing a song called 'Tree Top Flyer.' I just sat up in bed and listened. Something about that song just hit me. I did not go to work that day; I went to record stores and sought that album out. It was called Stills Alone. I listened to it, and I was transformed. It killed me?it was huge. You don't know how those things happen. I just knew: 'This is what I'm gonna do.' That morning really changed everything?my whole life. "So I quit my job. I knew I wanted to sing, which was really crazy, because I never even talked to anybody. I just had this feeling that it was somewhere inside me, and I had to find it and let it out. So I learned the songs on that record and started listening to Crosby, Stills & Nash, then I discovered Bob Dylan, Joni Mitchell, Neil Young, Ray Charles, Otis Redding. I would spend hours just listening to records. Later, I got very intense about singing; I would just sing and sing, and hurt and hurt, because I knew I wasn't doing it right. Over a period of years I taught myself to sing from the gut and not from the nose." In the summer of 1999, LaMontagne recorded his first demo?a collection of 10 songs. "It was the first time I'd ever heard myself sing," he says. "I hadn't performed. There was a little theater in town that would bring in folk acts. I brought my tape down to the owner and he loved it. He started getting me in opening for people like Jonathan Edwards, John Gorka?traveling folkies. It was hard for me at first, but I'm a really fast learner. By the third or fourth show, I was fine. "I started getting e-mails from this guy telling me that he really loved the music and had been playing it for his friends. We became e-mail friends. Then he invited me to play a show for his company cookout in Portland, Maine. I played and met him, and we really hit it off." Also present was the governor of Maine, who was so taken with LaMontagne's performance that he took Ray with him to a Willie Nelson concert. "Then the guy said he had a friend in the music business and would I mind if he sent the music off to him. I said no, and he did, and that's how I met Jamie Ceretta (at Chrysalis Music Publishing); Jamie was the friend." Cerreta headed east for a first meeting and a reunion. "I went out to see Ray in Maine after I heard his music," he recalls. "We ate lobster and drank wine, then Ray played for us. It turned out to be a special moment for both of us." LaMontagne was signed to a publishing deal at Chrysalis soon thereafter. Because Cerreta and Chrysalis CEO Kenny MacPherson considered LaMontagne such a special artist, the publishing company took the unusual step of making an album themselves and finding a record label home for the finished album afterward. In a period of just two weeks, Ray and the gifted, single-minded producer/player Ethan Johns (Ryan Adams, Kings of Leon, the Jayhawks) created Trouble. Recorded at the Alley and Studio 3 at Sunset Sound in Los Angeles, most of the tracks were tracked live, with Ray playing guitar and singing. Then Johns would lay in the drum, bass and piano parts. He also contributed the burnin' electric guitar riffs on "How Come," wrote the string charts, recorded them and mixed the album. The only other contributors on Trouble are Nickel Creek's Sarah Watkins, who plays fiddle and sings on "Hannah" and "All the Wild Horses," Jennifer Stills, who supplies backing vocals on "Narrow Escape," and a five-piece string section, which appears on several tracks. 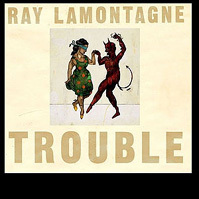 Soon after wrapping up production on Trouble, LaMontagne signed to RCA Records, where his debut album is scheduled for release on September 14, 2004. That brings us up to date. It would seem that serendipity is now Ray LaMontagne's middle name. He went from the middle of nowhere to making his first record in collaboration with a brilliant producer (Ethan Johns), and he did it without making a compromise or even breaking a sweat. But maybe Ray's sweated enough in his life. Maybe destiny is making up for lost time.